In my house being able to cook a delicious Italian meal whenever the urge arises is important. Having all the essential ingredients readily available is the key to making this happen. When stocking your pantry, an important thing to remember is that better quality ingredients will allow you to prepare better quality meals. 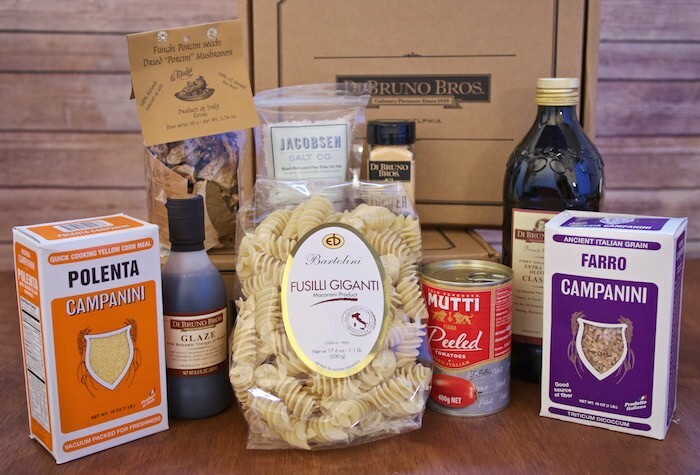 Although, most of the products I recommend below can be found at your local grocery store it's a good idea to also frequent a specialty store like DiBruno Bros. in Philadelphia for superior Italian ingredients. This Northern Italian staple is made from ground corn meal. Polenta has a long shelf life making it an ideal pantry staple. Serve it as a hearty side-dish with your favorite cut of meat or add it to cakes for an interesting texture. An ancient rustic grain found predominately in Tuscany & Umbria. Farro has a nutty flavor and can be used in most recipes that call for barley or brown rice. I like it best served in soup but have also made it as a side-dish. Dried porcini mushrooms are full of flavor and when re-hydrated can be added to stews, soups and pastas to enhance both taste and texture. This might seem obvious but a good quality pasta is just as important as the sauce it's in. Though I prefer fresh pasta when I can get it I always keep several of dried pasta in my pantry. A sweet dark vinegar that can be used to dress salads or drizzled over your favorite meat or veggies to add a hint of sweetness. Another essential ingredient when it comes to Italian food, olive oil is not only used for cooking but is often drizzled over the finished dish for added flavor. When it comes to Italian cooking its crucial to have canned tomatoes always on hand. They are the base for pasta sauces, soups and stews. The Neapolitan San Marzano are a variety highly preferred by most Italians. I received product, coupons or compensation for this post. As always, all opinions are 100% my own. Yes! These are great staples. I love those porcini mushrooms. Looks like I'm NEARLY set! I've never used farro, but I LOVE polenta!